Jean-Baptiste Sénat – “The man in black.” That’s my scribbled-down description of the winemaker we’ve come to visit, and it fits; he is, in fact, dressed head-to-toe in the color of night. Dark clothing, to befit a dark wine. Minervois is a known name, thanks to a lot of hard work on the part of a relatively small number of dedicated producers, importers, and retailers, but it’s most definitely not a well-known name, and the search for greater affirmation is a long, uphill struggle against the forces of multinational marketing. It doesn’t help that a lot of the wines that carry the name never really rise above mediocrity…though given the lack of acclaim and monetary reward that follows those that do, the desire to put in the necessary work has to come from somewhere other than the hope of remuneration. The vignoble of Minervois is visually and functionally hardscrabble, and that probably doesn’t help in the elevation of spirits. Staring at a field of rocks from which gnarled vines struggle to emerge and plump up a few angry grapes isn’t like gazing over the verdant plains and hillsides of certain other regions, nor are many vines neatly trained into efficiently-pickable rows. One can see the work that will be necessary, and the heartbreak that sprouts from the earth, and the indifference that droops from the leaves, in every beaten-down vine. And yet the region is absolutely carpeted with vineyards. That’s a lot of despair to crush, press, and ferment. But it’s a way of life, and that’s not easily abandoned. Thankfully, there are a few producers who put in the necessary work, and their truculent, embittered vines have decided reward the attention with a grudging but admirable harvest of quality. Jean-Baptiste Sénat is one such producer. 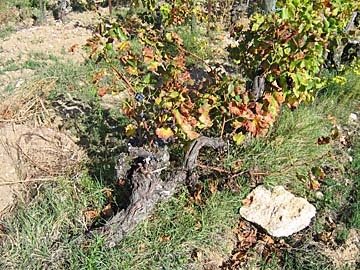 His vines are the usual regional mix – carignan, grenache, mourvèdre, cinsaut, a little bit of syrah (he doesn’t think his vineyards provide an interesting terroir for the grape) – and while some of them are quite old (the carignan, for example, comes from 1902), Sénat is fairly new to the game. He works organically, by hand, with natural yeasts, and without refrigeration, letting his casks (large and small) and subterranean vats find a natural equilibrium. He’s no reactionary dirt-seeker, though; his pleasure in wine, he insists, comes from the “glissando” of a balanced wine, and he’s not fond of overt austerity. Soon after introductions are made in the Sénat courtyard, we hop in his car for a trip into the vineyards. Tangled, knobby vines squirreling furtively amongst the stones look like torture victims that have survived, mangled and scarred, to a surprising old age. And there’s the surrounding scrub, which carries its own aromatic component; Sénat plucks a few plants from a slope covered in micro-leaved wild thyme, which (on the way back) fills his automobile with the persistent aroma of underbrush…an aroma that’s frequently found in the region’s best wines. Later, we embark on a cask tasting that – as they so often do – turns lengthy. 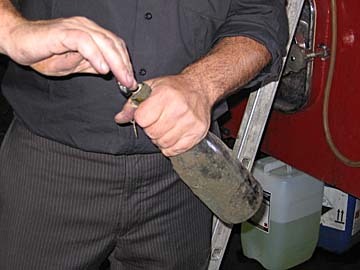 Winemakers always show far more samples than they initially intend. When they first start thieving containers, winemakers are trying to show the visitor something. But after a few samples, and especially if the response has been positive, it seems that their own curiosity takes over, and their methodical examinations of each lot (and the inevitable library vintages that follow) are more for their own edification than their guest’s. The duration of our tasting is helped along by another visitor, this one in the business – he sells wine, or bottles, or maybe corks; I’m scribbling during his explanation and miss the details – whose musings cause even more samples to be unveiled than might otherwise have been the case. The tasting is conducted from a quartet of glasses that…well, they haven’t been washed. Possibly ever. I attempt a little scrub of the rim while I think Sénat’s back is turned, but he sees me and raises a curious eyebrow. My fortitude now in doubt, I man up and proceed with the sipping; it’s not like the wines won’t kill whatever’s in the glasses, anyway. Sénat 2006 syrah/mourvèdre blend, pre-malolactic (barrel sample) (Languedoc) – Spicy blackberry and blueberry. Mostly about the nose. Spiky acidity. 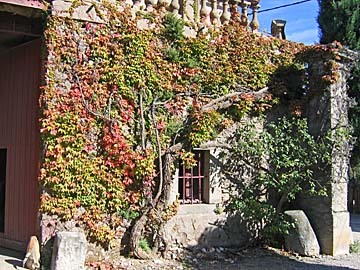 Sénat 2006 grenache (barrel sample) (Languedoc) – Strawberry, grape leaves, and good structure. Firm. Sénat 2006 grenache & mourvèdre (barrel sample) (Languedoc) – Leather, smoked blueberry. Thick and extremely dense, but with a fine concentration of grapey, primary fruit and very impressive structure. A complete wine, even in this state. Sénat 2006 carignan (barrel sample) (Languedoc) – Many, many hundreds of fruit flies accompany this sample, both atop and in solution. Rough, stinky, and rustic. Smells sulfurous, though Sénat says that hasn’t entered the picture yet. Hollow, but with a dramatic palate impact. Sénat 2006 destemmed carignan (barrel sample) (Languedoc) – Crushed berry residue and the aromas of a wild, old-growth forest. Tangled, thorny structure. Very slightly green. It’s hard to believe that this and the previous sample are the same grape. 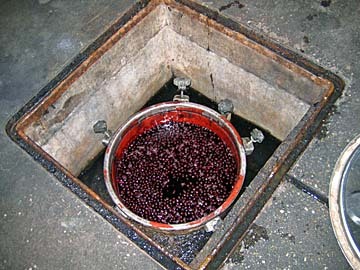 Sénat 2006 syrah (barrel sample) (Languedoc) – From an underground fermenter, still full of bubbling sludge, which requires Sénat to employ a long, spindly ladle rather than a thief. Big blueberry and leather, with good acidity. Approaches true audacity, though of course part of that is the stage it’s in. 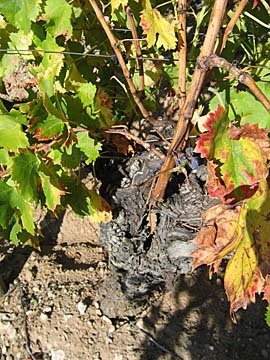 Sénat 2006 mourvèdre, mid-malolactic (barrel sample) (Languedoc) – Thickness in three textures: leather, satin, and paste. Masculine. Sénat 2006 mourvèdre, pressed yesterday (barrel sample) (Languedoc) – Massive fruit. Squeezed explosions of grape juice, with a fine equilibrium that’s already evident. And then, our lips and teeth as stained as our glasses, it’s on to the bottles. Sénat 2005 Minervois “La Nine” (Languedoc) – Grenache, carignan, and mourvèdre. Raspberry bubblegum with a large-boned structure and a thick waist. Raw leather, blackberry, and blueberry infused with herbs rush through the palate, and there’s a good deal of earthiness underneath that occasionally hints towards a tar-like quality. Impressively long. There are little nits at which to pick here, but it’s a good wine. Sénat 2003 Vin de Pays des Côteaux de Peyriac “Les Arpettes” (Languedoc) – Merlot, grenache, and carignan. Mixed seed peppers smoothed by gentle applications of blueberry and black cherry. Fades on the finish, and not particularly complex. 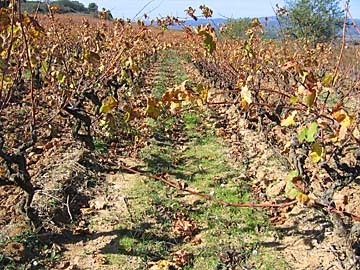 Sénat 2004 Minervois “Le Bois des Merveilles” (Languedoc) – Grenache and mourvèdre. While this shows the darkest possible fruit, there’s a sweetness and purity to it. 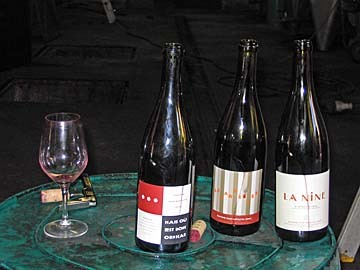 Leather, earth, black-‘n’-blueberry, cèpes…all concentrated and very, very long. Terrific balance. Marvelous. Or rather, merveilleux. Sénat 1996 Minervois “Le Bois des Merveilles” (Languedoc) – Despite the name, compositionally similar to “La Nine.” Very spicy, with black earth, seared chanterelles and morels, and black truffles. The ‘shrooms dominate, but there’s also a core of wild blueberry and wild thyme. Delicious, and while it’s not fully mature, it could very well be approaching its best. Our fellow taster pulls a wine from his trunk. It’s a new geographical designation for me…and it’s not red, which should be interesting after all these heavy Minervois. Magnon 2005 Vin de Pays de la Vallée du Paradis “le bégou” (Languedoc) – Old-vine grenache gris. Apricot, grapefruit, and soda-spice on the finish. Fun, clean, and long, though there’s a bit of exotic complexity to the finish.